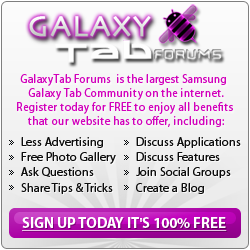 Discussions and Information for custom Galaxy Tab 10.1 ROMS. This area contains Galaxy Tab 10.1 ROM releases. The perfect section to discuss ways to customize the entire look of your Galaxy Tab 10.1 with custom themes. Possible to Turn Galaxy Tab 10.1 into WiFi Repeater? Charging while in USB host mode ? Rooted GT-P5113, Update Downloaded, Not Installed. How to Remove It? ICS Roms for the Galaxy Tab 10.1 Wi-Fi?